The Perfect Club Golf HD2 Driver lets you play golf the way it was intended to be played-from the fairway. The Perfect Club Driver is shorter shafted than a conventional driver; and is therefore a "best driver in golf" for solid and accurate tee shots. 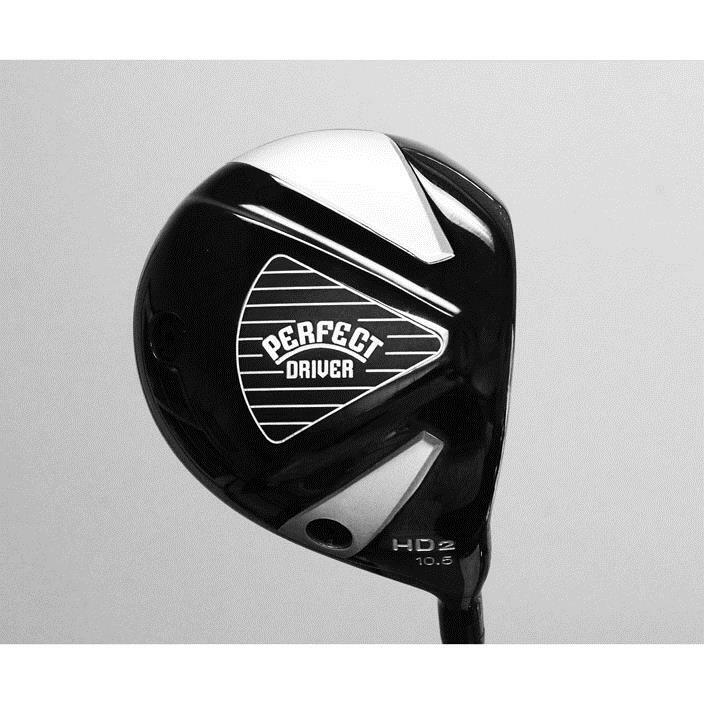 Perfect Club HD2 Driver. New for 2019! Now Available! + Head cover included: HD2 is USGA & R&A Conforming. Plus! 30-Day On Course Perfect Guarantee! The Perfect Club Golf HD2 Driver will take big numbers off your scorecard by letting you play the hole the way it was intended to be played - from the fairway! Our customers experience confidence like never before on the tee box. They hit the ball more solid more often with great accuracy. This is something you rarely experience with other long shafted drivers or maybe just a few holes in a round. Confident aggressive swings will translate into distance and accuracy off the tee. Obviously once you start hitting more fairways, you'll also be hitting more greens! The HD2 has perfect combinations of aerodynamic speed, mass, length and weight to drive the ball with explosive distance. Watch your confidence build when you put the HD2 driver in your hand and the ball goes farther and straighter. Is the Perfect Club HD2 Driver legal? Why is a shorter driver better for you? Unless your 6' 3" will a low handicap, why are you playing a driver that is 45 inches or longer that significantly lowers your chance to make solid contact or hit the ball with accuracy? The Perfect Club HD2 Driver is specifically designed for players seeking higher, more powerful draw-biased trajectory. Allows the head to accelerate quicker with less drag while creating exceptional balance through the hitting area. The HD2 dual weighting placement allows the club head to close quicker creating a massive amount of Coefficient of Restitution (COR) energy that is transferred into the golf ball. We spared no expense on top quality and safe finishing only available from a few golf manufactures. PVD Coating produces highly brilliant finishes that is highly resistant to scratches, scrapes and corrosion. Helping your new driver last and looking better longer! Also PVD finishing is applied with no toxic residues or byproducts making it environmentally friendly. Every component of the PCG HD2 Driver is made of the highest quality materials. We manufacture our own custom 100% graphite shafts specifically designed just for the HD2 Driver. What makes The Perfect Club HD2 Driver Perfect? Drivers used to be 43" inches in length with a wooden head and steel shaft, now they are 45.5 inches in length or longer. Only the most gifted athletes can handle the long shaft of a conventional driver and successfully square up the club head at impact. The Perfect Club Golf HD2 Driver is 43" inches in length, high grade titanium head and face with custom graphite shaft. The shorter shaft makes it possible for recreational golfers to easily square the club head at impact to consistently produce solid hits. What does The Perfect Club HD2 Driver have in common with the other Perfect Clubs? The Perfect Driver is completely consistent with the philosophy that has made the Perfect Clubs so successful and easy to hit. The Perfect Club HD2 Driver, like The Original Perfect Club, was built on the successful proven premise that shorter shafted clubs with generous loft are easier to hit than longer shafted clubs with minimal loft. How far can I hit The Perfect Club HD2 Driver? Most golfers only hit one or two successful drives with the driver they are presently using during an 18-hole round of golf. Recreational golfers don't generally put the ball in play with their driver and errant drives are the major source of high scores for recreational golfers-it's hard to make good scores from the woods, deep rough and water. Conventional drivers are the hardest clubs to hit of any in your bag because it's the longest club in the bag. The shaft of The Perfect Club HD2 Driver makes it incredibly easy to square the club head at impact regardless of your ability and experience as a player. A square club face at impact is what produces straight shots. Because the Perfect Club HD2 Driver is so easy to hit and easy to hit straight, golfers will become extraordinarily confident in their ability to put the ball in the fairway. Confidence leads to more aggressive swings, which means greater club head speed and longer drives. Golfers using The Perfect Club HD2 Driver have found that they keep the ball in play and that the consistently square strikes have them hitting their drives as far or farther than shots struck with the driver they have in their bags now. Play from the middle of the fairway and lower your scores. Why can't I just cut my driver down a couple inches? Cutting your current driver down even just a half inch will significantly change the dynamics of your driver. Golfers have tried this and it does not work. Doing this will change the swing weight, stiffen the shaft greatly and make your head lie angle flatter at address causing very bad and low slices. We design all aspects of our driver to match perfectly with the head weight, lie angle and shaft for peak performace. Is the club head of The Perfect Club HD2 Driver traditional looking size and shape? The club head of is absolutely classic and conventional in its appearance. The shape and size of the club head is consistent with the shape and size preferred by most professional and recreational golfers. Shorter shaft, more upright lie angle, and increased head weight (the benefits of which are detailed above) are the primary differences between The Perfect Club HD2 Driver and other drivers on the market. What are the important specs of The Perfect Driver 370? The Perfect Club HD2 Driver 10.5 degrees of loft, a 43 inch shaft, D2 swing weight, highest grade Titanium face and head with variable thickness technology for maximum COR effect, high modulus, 3.5 degree low torque custom shaft. Where do I play The Perfect Club HD2 Driver in my stance relative to the Driver I use now? You should play The Perfect Club HD2 Driver where you would play any other driver. Inside your left heel or 1 to 3 inches left of your sternum. What shape shot should I expect from The Perfect Club Golf HD2 Driver? The Perfect Club HD2 Driver will tend to produce a high gentle draw which leads to more distance in the air and on the ground. Verified Buyer Review: 5 of 5 Total Reviews: 44 Write a review.